After 15 years of searching, the perfect Ecuadoran Sumatra wrapper leaf grown in open sunlight was finally procured and Drew Estate's Master Blender Willy Herrera and the Undercrown Blending Team were able to begin the painstaking blending process for Undercrown Sun Grown ~ the third line in the remarkable Undercrown cigar series. The special golden brown wrapper leaf covers a Connecticut River Valley Stalk Cut/Cured Sun Grown Habano binder (aka the Liga Privada T52 wrapper leaf) that complements a powerhouse blend of Nicaraguan premium fillers, including one aged Ligero leaf from Nicaragua's Nueva Segovia region for added strength. 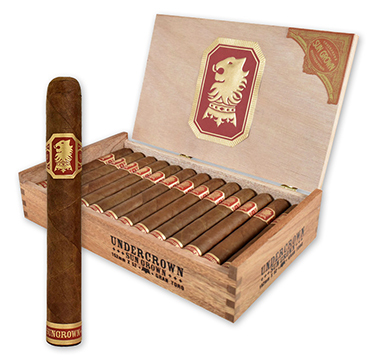 The medium-bodied, full-flavored Undercrown Sun Grown is expertly handmade at La Gran Fabrica Drew Estate in Nicaragua and shares a unique flavor profile that will surprise and delight with notes of sweetness, tang, and spice.